Document Publisher makes producing documentation based on Cradle data easy. The “formal document” function added the ability to restrict who can publish formal documents and create a copy within the database with links to the status of each item included in the document. We have talked with a number of businesses who need to take their documentation one step further for contract and/or regulatory purposes and add a digital signature. According to TechTarget, “The digital equivalent of a handwritten signature or stamped seal, but offering far more inherent security, a digital signature is intended to solve the problem of tampering and impersonation in digital communications. Digital signatures can provide the added assurances of evidence to origin, identity and status of an electronic document, transaction or message, as well as acknowledging informed consent by the signer.” Industries with significant safety concerns such as power generation and healthcare are frequently required to provide a digital signature on documentation provided electronically. Some Cradle users have separated the process of producing the document and signing/storing the digitally verified copies in a process where they publish the document from Cradle and then sign and store using a separate document management system. Others are integrating their formal document process in Cradle to include the signature. 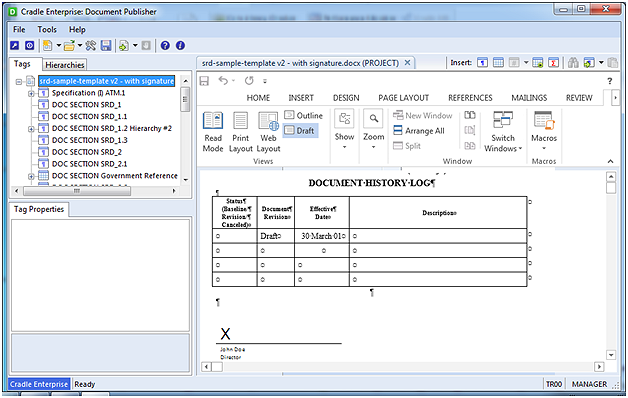 Open Cradle’s Document Publisher module and select the template to edit and add the signature block. 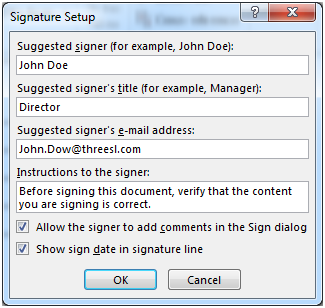 Allow the signer to add comments in the Sign dialog box - allow the signer to type a purpose for signing. Show sign date in signature line - signature date will appear with signature. 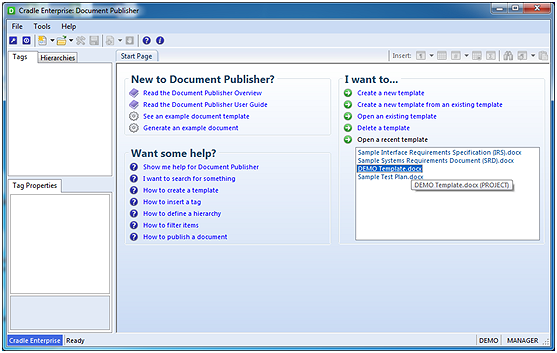 The signature block is added to the Document Publisher Template. Save the Document Publisher template for use when the data is ready to be published. Note: Some digital signature applications have their own Word plug-in. A signature block maybe added using these plug-in in a similar manner as above. Once the project data has been appropriately reviewed and a formal document is ready to be published, open Document Publisher and select to publish a formal document. In order to produce a formal document through Document Publisher, at least one user must have the correct user privilege (FORMAL_DOC). A user with the general Document Publisher privilege can publish a draft document (COMPOSE_DOC). At typical process may be to provide the basic privilege to those creating templates or producing draft copies for users outside of Cradle to review prior to formal publishing. The formal document would typically be published after the baseline process related to data to be included in the document was complete and any non-Cradle users have provided feedback. When publishing the formal document, the approved user clicks to publish the document. Once the document is produced, it is ready to be signed. If you do not have a valid digital signature certificate the following dialog is presented to allow you to obtain a signature certificate. If you have a valid digital signature certificate your name will be placed on the signature line indicating you have approved this document. Once the document is signed, any change will invalidate the signature. This ensures anyone reviewing the document is certain that it is in the same state as when it was signed. The document may be saved, emailed or shared as needed. As of Cradle-7.0, the version of the formal document saved into the Cradle database will not have the signature. The document is signed after the copy is saved to the project. 3SL is considering options for including the signature function in the publishing process so as to save a signed copy to the project automatically. If you need to store a signed copy within the project it may be saved into a frame as any other Word document would be.